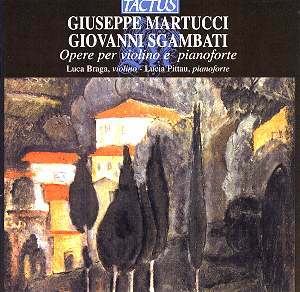 Both Martucci and Sgambati are interesting figures and both wrote some fascinating music. It has, though, to be said that the works brought together on this CD, pleasant as they are, are not amongst the most important creations of either composer. Martucci was an important presence in the musical life of his time. His skills as a pianist won him the praise of Liszt; as a conductor he was admired by Richard Strauss. Martucci, indeed, conducted the Italian premiere of Tristan und Isolde in 1888. He taught in Naples and Bologna � Respighi was one of his pupils. As a composer the best of Martucci is to be found in his two symphonies (especially the second), in his piano concertos (the second is particularly fine), in his splendid song-cycle La Canzone dei Ricordi, in some of his works for solo piano and, perhaps, in such chamber works as his piano quintet and trio. The violin sonata which opens this programme was written when Martucci was eighteen; unsurprisingly there is about it more than a little of the talented student rather than the fully formed composer. None of this is to deny that the work has a certain lightweight charm. There are some attractively lyrical passages and moments of intriguing instrumental interplay � but it doesn�t, finally, seem to have a great deal to say. The Three Pieces of 1886 have more in the way of content � the first is graceful and dignified, the second is an engagingly reflective piece, with a pleasing sense of poise, and the third is somewhat lushly romantic. The brief Melodia has a rather melancholic, sepia charm, but like its companions it doesn�t offer much that is really individual, either formally or emotionally. Giovanni Sgambati, younger contemporary of Martucci, was another gifted pianist, something of a favourite pupil of Liszt. As with Martucci, the strongest musical influences came from the German tradition � especially from the example of Schumann and Brahms. He conducted a number of Italian premieres of German works � including Liszt�s Dante Symphony. He corresponded with Wagner and Strauss; indeed, Wagner�s initial hearing of Sgambati�s work for piano quintet at a concert in the German Embassy in 1876 led him to describe Sgambati as a "most authentic and original talent" and to encourage the publication of his work in Germany. Sgambati later established the Liceo Musicale of the Accademia Santa Cecilia in Rome. Again, these two works for violin and piano can claim only a rather minor place in the canon of Sgambati�s work � they do not rival his Piano Concerto in G minor, his D major symphony, or the best of his works for solo piano. The Two Pieces are engaging enough, especially the second, described as a �serenata napoletana� and the Gondoliera has real charm, evocative of a peaceful, fluid Venetian scene. But, in truth, it can�t really be claimed that any of this is more than superior salon music. Luca Braga and Lucia Pittau give committed and well-calculated performances throughout, sympathetic to the music�s idioms and resisting any temptation to oversell it. The whole makes for some pleasant, undemanding listening and offers an insight into the lesser works of two figures of importance in the nineteenth century movement to re-establish instrumental music in an Italy dominated by the claims of opera.